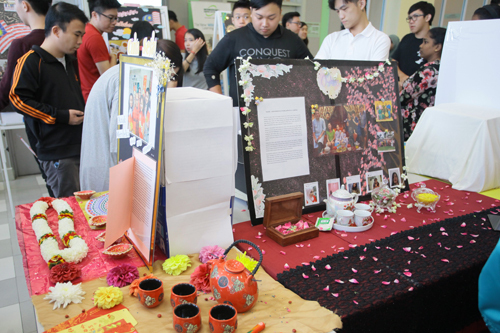 The Malaysian culture, cuisine, lifestyle and harmonious spirit were the focus of the exhibits displayed by the full-time students at the Photo Exhibition held in the main campus today. 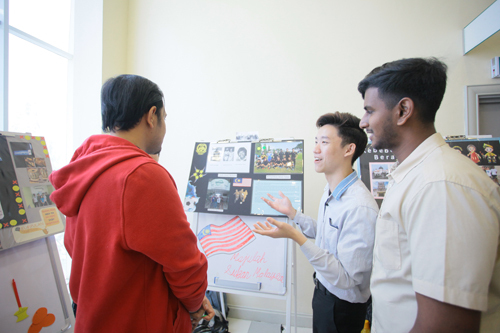 A total of 21 groups of students pooled their resources together to present their best work at the exhibition titled ‘Ethnic Relations in Malaysia’. Staff and students admiring the exhibits. The project was organised by Lecturer Rabikha Hasni from the School of Humanities & Social Sciences (SHSS) as part and parcel of the students' assignment for the MPU3113/03 Hubungan Etnik course. It was designed to be a team effort of the students from different ethnic backgrounds to produce their final project photo and descriptive write-up. On hand to present the award certificate to the winners at the Photo Exhibition was Assoc Prof Dr S Nagarajan, the Dean of the School. Dr Nagarajan (centre) with the winning teams. The Best Photo award was won by the Cendol Ais Kacang group for their excellent snapshot of a devotee carrying kavadi during the Thaipusam festival. The group members were Chew Chin Chai, Tan Hui Fen, Gangasri Buvaneswaran, Sumiyyah Zainul Abiddin and Lee Ling Hui. Rabikha (right, foreground) views the Best Photo exihibit. The Orkids team who showcased a mixed marriage in pictures won for Best Creativity. Its members were Nur Rashada Abdul Mubarak, Mindy Ooi, Lim Ching Li, Nerroshini Manoraj and Jegatheswary Mani Kumar. Orkids group photo exhibit on mixed marriages. The Best Theme award went to Nasi Kandar who highlighted Sports Excellence in Malaysia and past football legends like Soh Chin Aun, Mokhtar Dahari and Arumugam. The team comprised of Lew Tze Wei, Yim Zhen Xian, Diwagar Ravi and Dhenaaratchagan Madiyalagan. Two members of the Nasi Kandar group, which won Best Theme, explain their concept. Fellow students and staff who visited the exhibition were enlightened about the local happenings through the photos and explanations offered.